London's busiest day of the year for road, rail and air travel is expected as thousands of people begin their festive getaway on Friday. Heathrow Airport said it was expecting 123,000 passengers to depart and 104,000 to arrive. At Gatwick about 1.5 million people are expected to travel through the airport between 17 December and 2 January. 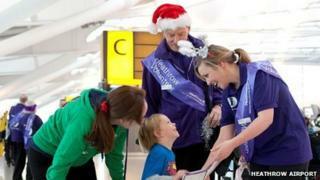 Volunteers from the London 2012 Games have been drafted in to help passengers at both airports. They will be handing out children's packs and giving safety advice. Normand Boivin, Heathrow's chief operating officer, said: "Christmas is a special time for Heathrow as our passengers travel to make connections with loved ones. "I am particularly delighted to welcome back our London 2012 volunteers who were such a great success during the Games." Between Friday and 3 January 300,000 are expected to fly out from Stansted, and 125,000 from Luton. London City Airport said about 11,000 people travelled through every day, and it expected Friday to be "business as usual" with a slight upturn. The Highways Agency said more than 250 miles of roadworks in England would be completed before Christmas. A further 57 miles of roadworks will be suspended between Friday and 2 January, the spokesman added. Trains out of Euston will be disrupted from 23 to 27 December because of a major re-signalling project on the West Coast Mainline at Bletchley. A Network Rail spokesman said the work, part of an upgrade to improve line speed, would provide more reliable signalling and allow longer trains to run. The work had been planned for the past three years with the co-operation of train operators, said the spokesman. Virgin Trains said it had seen "exceptionally high" bookings over the Christmas period and boarding controls would be in place at London Euston. The company said some seats would be available for passengers without reservations, but priority would be given to people with reservations. "Customers should also check timetables as Network Rail is carrying out extensive route improvement work from Sunday 23 December," the spokesman said. "For a lot of these jobs, Network Rail need to have a number of clear days because the work is quite intricate and intensive," he added. The AA said Friday and Saturday were expected to be the busiest days on the roads, with 60% of AA members likely to take to the roads over the festive period. The A40 Greenford Flyover will be closed from 22:00 GMT on Christmas Eve until 05:00 GMT on 3 January for some major works to the flyover and its road surface. Traffic will be diverted via the roundabout underneath the flyover and a wider diversion route for traffic wishing to access the A406 North Circular Road. Transport for London (TfL) said the Congestion Charge will be suspended from 25 December to 1 January inclusive. Cycle hire bikes will be available throughout the festive period although some docking stations may not be in use, particularly on New Year's Eve.